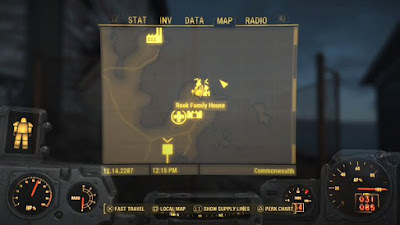 - Salem is the northeastern-most town in the Commonwealth, and a long walk east from Sanctuary. You’ll find the town nestled along the shoreline. There are plenty of things to see ‘round town, but your first destination should be the Rook Family House. The House is on the far side of town, overlooking the sea - though when you enter Salem a loud, whooping voice will pretty much tell you where to go without much need for guidance. - Upon approaching the House you’ll find a dude named Barney standing on its roof, and at the bottom you may or may not see one, two, or three Mirelurks. They’re wandering around the grounds, and in order for Barney to open the gate for you all three need to die. Wander around until you attract and kill the Mirelurks. - Go through the gate on the right side of the House. It’s a burnt-out husk at this point, and there’s little inside - though you can find an Armor Workbench on the second floor, and a bunch of ammo up in the attic where Barney was sniping Mirelurks. (I found four Fusion Cores in one of the ammo boxes. Sweeeeet.) Barney disappears into a trap door beneath the stairs on the ground floor; follow him down. 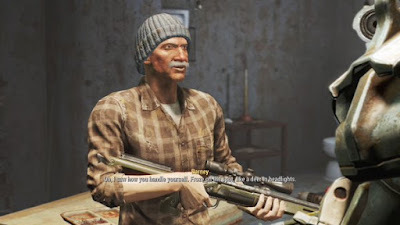 - Barney will introduce himself - and Reba, his lovely gun - and then more or less demand that you solve his Mirelurk problem by reactivating a number of Turrets he set up around town. He’ll give you Barney’s Password to get the job done. If you ask for compensation he’ll offer another Reba he’s putting together. Once he’s done jabbering, check the desk by the lamp for a Guns and Bullets magazine before leaving. Barney, the final man of Salem. Also Reba. Don't ask what he does with Reba. Barney’s task is fairly minor, and will give you a chance to wander around Salem and take in the sights. Let’s have a look while we activate some Turrets. Be careful - Mirelurks will now be active as you wander around. If you scale the cliff behind the House you’ll find a dock. It leads to a mostly-sunken tugboat. You can, in fact, find items inside the tugboat if you swim into the cabin. Are they worth the effort? No, no they are not. Head southwest from the Rook Family House and you’ll find little of interest within Salem itself, save for two independent locations: the Sandy Coves Convalescent Home, more or less in town, and the Museum of Witchcraft, which is more on the outskirts. Both are worthy of investigation. If you wander along the eastern edge of Salem you’ll find the seashore. There’s not a ton of interest on the beach, aside from some shacks and the loot therein, but there are a lot of Mirelurks. Make enough noise and they’ll be joined by more from the streets. Be careful, and be ready to flee if you can’t kill them quickly. There’s at least one Mirelurk Hunter hereabouts, and you should not mess around with those things. There’s a wrecked plane off the coast of Salem. Nothing special about it, it just looks cool. Time to head towards the centre of town. Just across the street from the Convalescent Home is a large building with a Drumlin Diner attached to one side. Check the alley beside the Diner to find the first of the Turrets. Barney’s Password used on the terminal beside the Turret will turn the gun on. The Mirelurks start getting fiercer, so be prepped to fight. Across the street from the Diner is a church. Use the stairs behind the pulpit to reach the upper floor (mind the ammo box near the toys up here), then cross the balconies to find stairs to the steeple. The terminal up here activates another Turret. You can also find some ammo, a Mini Nuke, and a Caps Stash up here. Just.. be careful not to fall. Across the street to the north of the church is a burnt-out military surplus store. You can access the inside via stairs on the left side; they lead up to the terminal and Turret combo. Among other things you’ll find a Fat Man here, on the shelf beside the terminal, which makes me question just who the hell owned this store. Inside the shop’s first floor you can find a Master locked safe. There’s a line of near-ruined buildings in the northeast. Enter the middle building and you’ll find the last two Turret / terminals on the upper floors, one of which you need to reach by going through the remains of a wall on your left. There are multiple Mirelurks up here, so be cautious. The stairs are good places to avoid their claw attacks, so long as you back up in time. - There are a few more places you can check - the houses on the edge of town have some fairly common items, for example - but you’re otherwise done with Salem. Head back to Barney’s place and he’ll give you Barney’s Key, which will allow you to raid his workroom. Enjoy Reba II! She’s good against Mirelurks and buggy creatures.